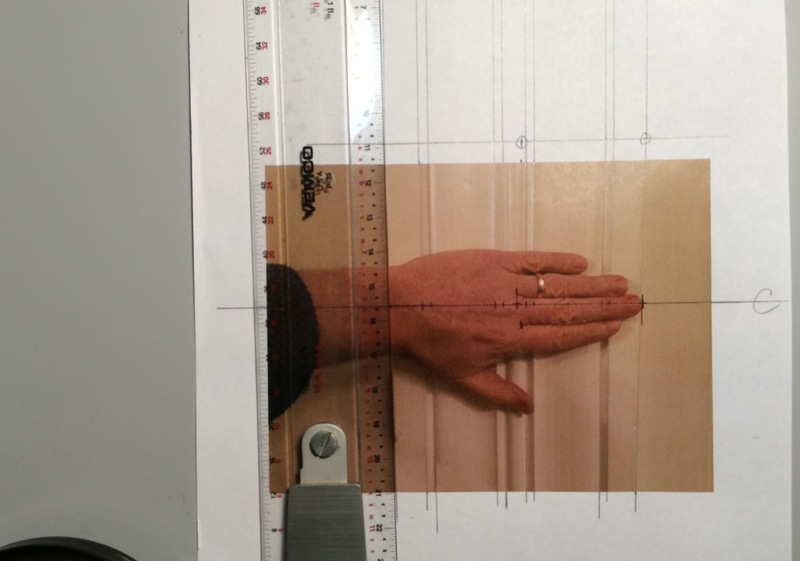 In February I posted an article about using your hand in photographs as a scale reference but didn’t go into how you extract that information once you have a copy of your photos. Here are three methods, two analog and one digital, that you can use to figure out hard dimensions from objects in photos. Once you have had some practice, this is the fastest method of the three, even faster that the digital method and you can use them right off a photo from a book or even a smart table screen. 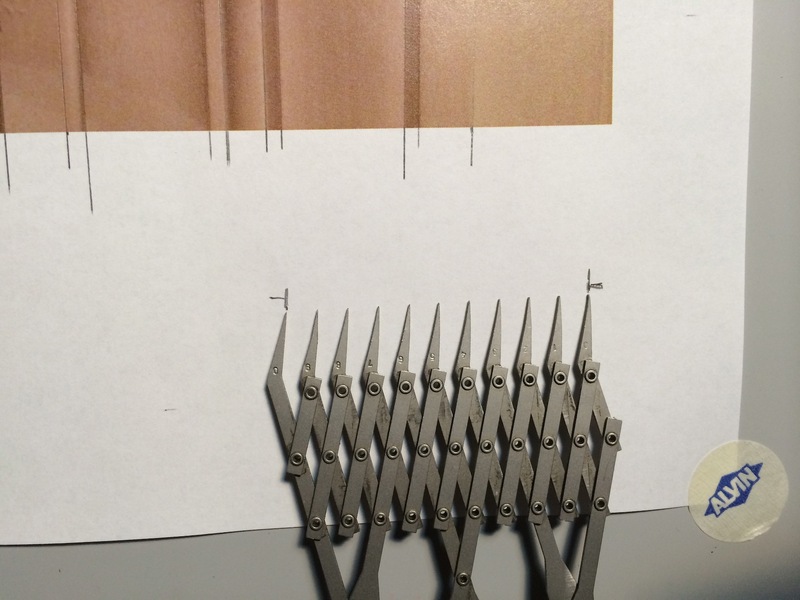 If you don’t have a set of equal dividers, also called 10 point dividers, you can buy a new pair for between $250 and $300 from various sites such as this one, or this one . They sometimes show up on Ebay but plan to pay around $75 to $100 for a used set. 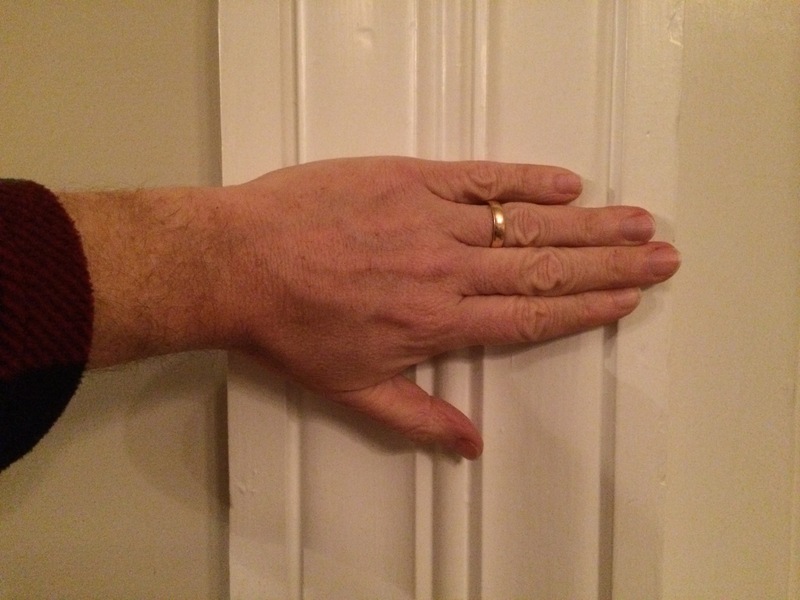 In this photo of a 1840’s Greek revival casing, we’ll scale the actual size using the hand in the photo as a reference nomen. 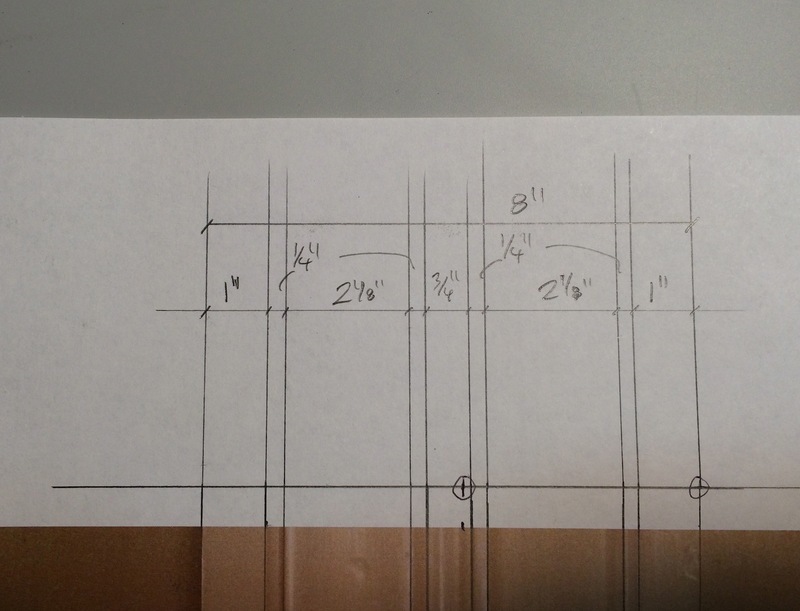 The first thing you’ll want to do is draw lines outlining the sides and edges of the moulding details, then you’ll draw a centerline through your scale, whether it’s a hand or tape measure. Then draw a line parallel to this at the top of the picture crossing the outlines. Now continue the lines perpendicular to this new datum line so that they are parallel which eliminates the perspective/foreshortening effect of the photo. Then mark a known distance on the original centerline, in this case it’s the distance from the tip of the middle finger to the end crease which is 3 3/4″. Now transfer these two points to the new datum line at the top of the photo. With the dividers, open them along this datum line allowing the distance between each point to equal 1/2″. 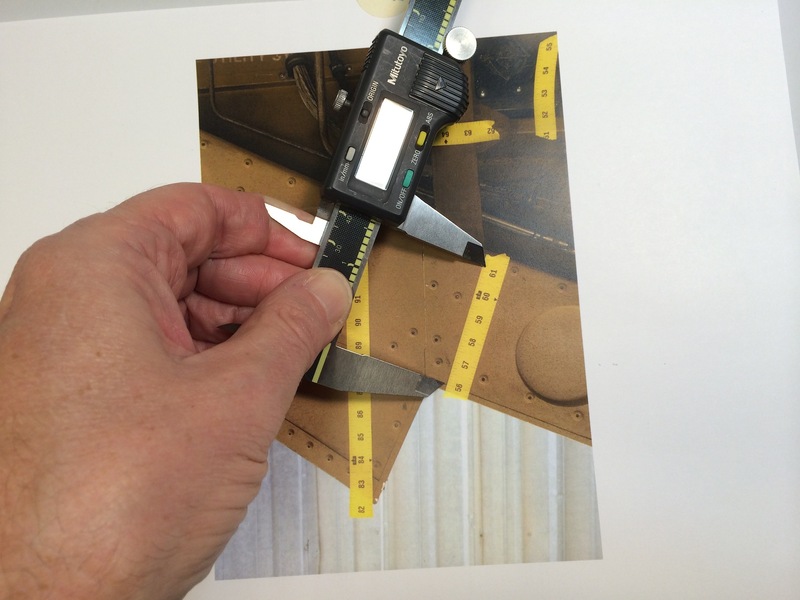 They can represent any distance you want them to, but 1/2″ works best for this example. This means that 7 1/2 spaces will equal 3 3/4″ scale inches along the new datum. Once you have these marks set, carefully move down to the bottom of the page and mark the distance at the first and last point. As each space represents 1/2″, the distance over the width of the dividers is a scale 5″ along the nomen line. For accuracy you’ll want to continuously check the spacing of the dividers against this ‘master’ to be sure you haven’t changed the setting. 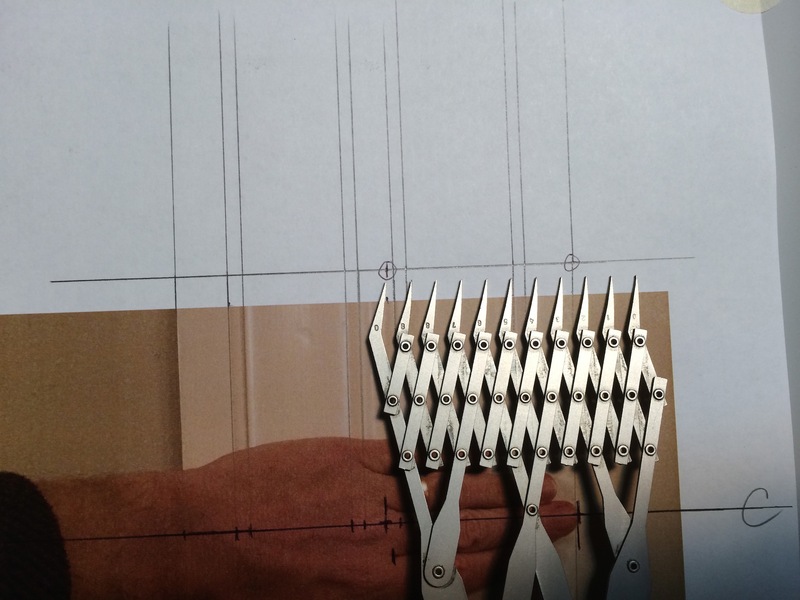 Most dividers are manufactured with fairly ‘tight’ joints but you can easily bump them while you’re working and throw off the setting. 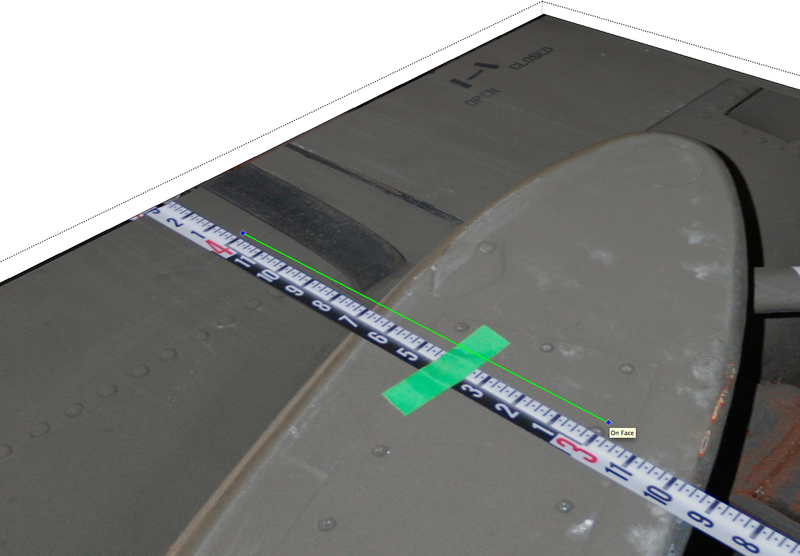 Now we have a scale to measure the spacing between each of the line extensions above the top nomen line. You can mark the distance at the middle point and reduce the spacing of the dividers to equal 1/4″ in scale and so forth. I came up with an 8″ width, which when I checked the casing with an actual measuring tape, found it to be in reality 7 7/8″ to 7 15/16″. Not bad, well within the accuracy of most applications. This method is not only more accurate than the equal space dividers but is a cheaper method as well, just not as fast at first. 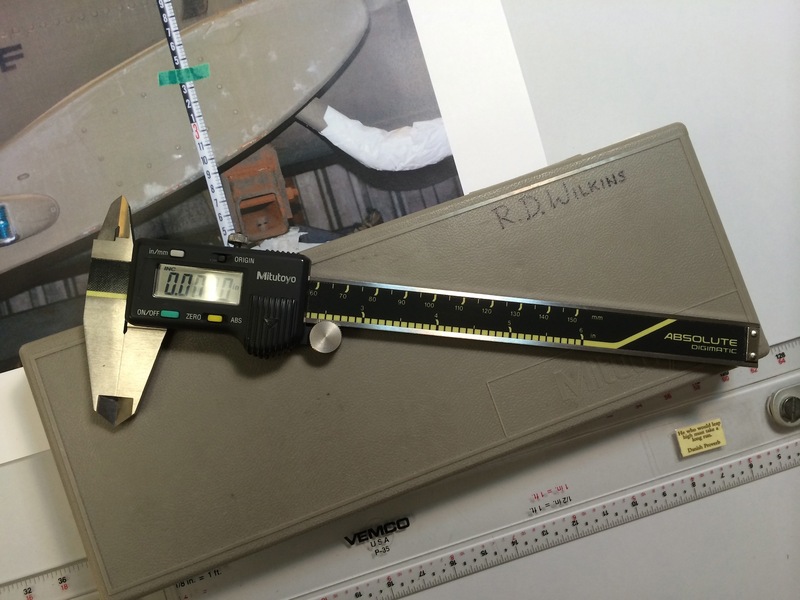 I have a set of Mitutoyo digital calipers which run about $180, but you don’t need anything that accurate. You’re going to be dealing with nothing finer than a thou of an inch and even that’s pushing it. A $12 pair like these are more than adequate, in fact this $9 cheap plastic pair are even better as the sharp points on the jaws of the better calipers will rip the crap out of the surface of the page of a book or the emulsion of an enlargement. They’re a lot safer to use when you’re scaling off a computer screen as well! They all have the ability to be set for decimal inches or metric. The nomen in this photo is a Keson Pocket Rod, a retractable builder’s survey pole, ( don’t know if it comes in a metric version) if you don’t have one, get one right now. You’ll wonder how you got by without it. 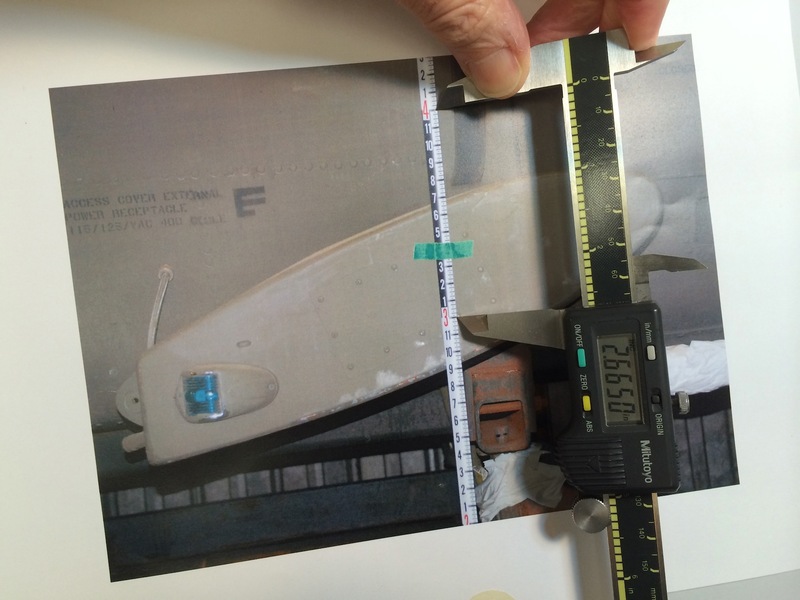 With a graduated scale in the photo it’s easy to find a correct scale. Turn the calipers on, squeeze the jaws together and zero out the reading. then you just set the jaws between a one foot increment and record the reading. 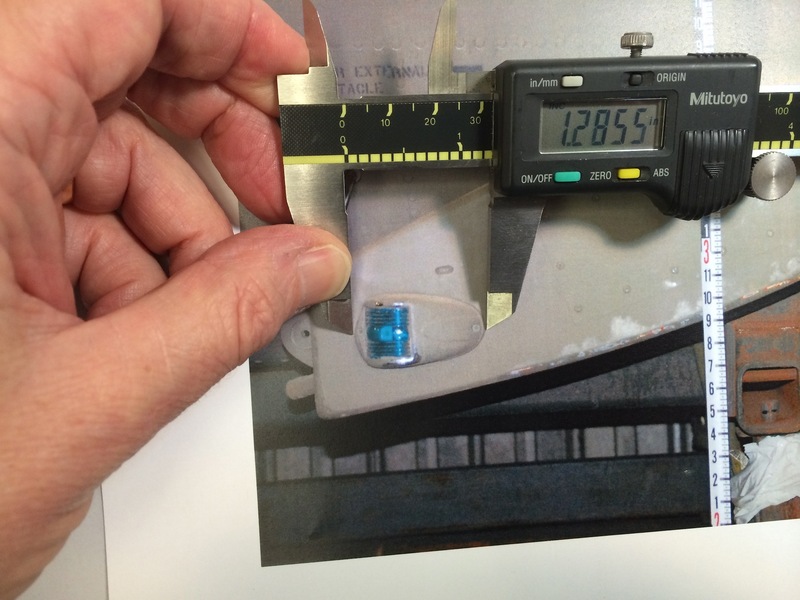 In this example 1 foot equals 2.665 inches. 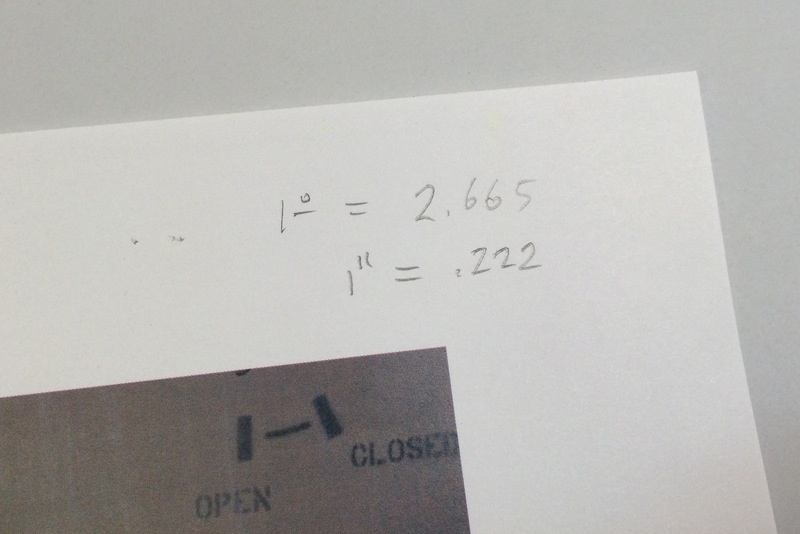 Divide this number by 12 and you come up with .222 inches equaling 1″ in the photo. Record these numbers for reference at the top of the photo. Remember that this equivalent will only be accurate over the whole area of the photo if you have been careful to make sure your camera was perpendicular to your subject matter. I could go into allowing for foreshortening and lens distortion calculations but that would take an entire chapter of a book. There are other options to the survey pole or tape measure. Richard Mays introduced me to graduated adhesive tape on a movie several years ago and it’s a great tool. You can put several pieces within the frame and you’ll quickly see if you have foreshortening issues. Art Director Jim Wallis has provided a manufacturer and source for ordering some for your kit. Or this one, Or this source for both imperial and metric with story pole writing space. n to do any 3D modeling with them, Sketchup is a good place to start. 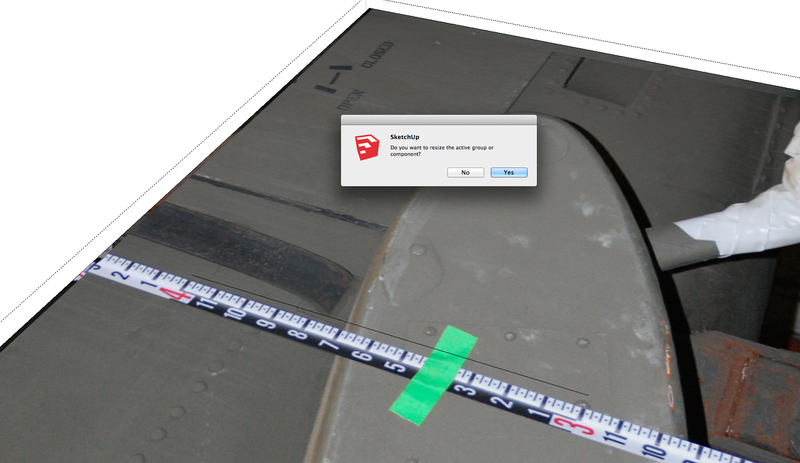 In Sketchup you’ll create a horizontal face and import your photo using file/import. Be sure to import the image as a texture. Stretch the image to fill the face and click. 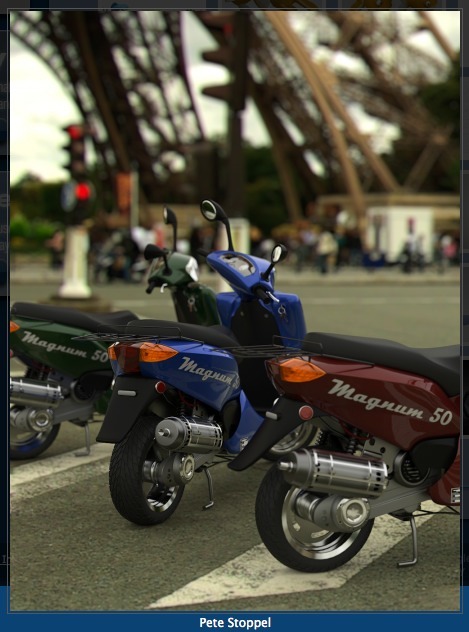 The image will tile itself over the face, so just trim the excess repeated images. Create a Group and double-click to open it for editing. This is an especially important step if you already have other object or images in your model file. With the Pencil tool you’ll draw a line along your nomen marking out a specific distance, in this case 12″. the longer the line the more accurate your scaling will be. With the ruler tool, measure this line from one end to the other. Ignore what it tells you the length is. Type the length you want it to be which will appear in the Value Control Box in the lower right corner of the window. When you hit return , a box will appear asking you if you want to resize the object. 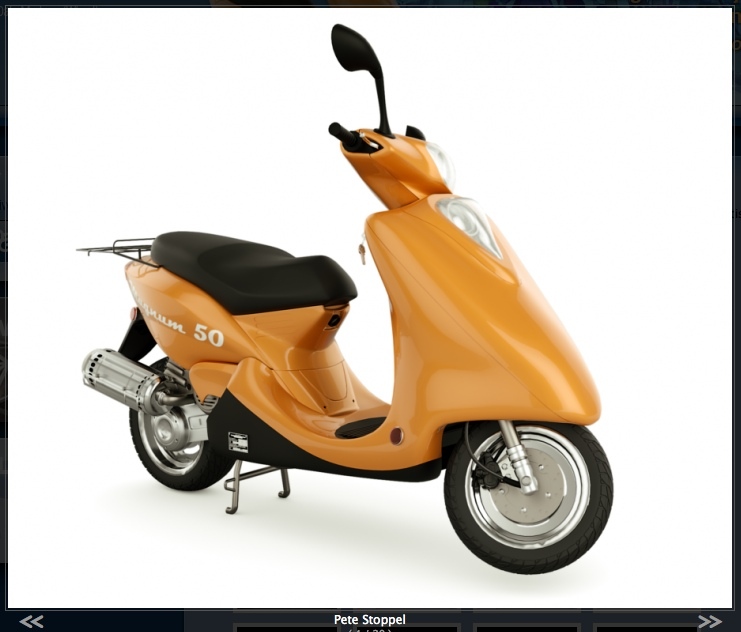 Click ‘Yes’ and the object will shrink/grow to the correct size and your photo image will now be at full size scale. There’s just one day left to pledge to the Spike Kickstarter program and get the early release Spike laser measuring accessory for smartphones. For a pledge of $389, you get a Spike Pro device and software for less than half of what it’s going to cost when they are released on the retail market. This isn’t an ad and I’m rarely so excited about tech devices considering how many of them are released every year, but this thing is flat-out amazing. If you do many location surveys it will save you a lot of time and frustration. 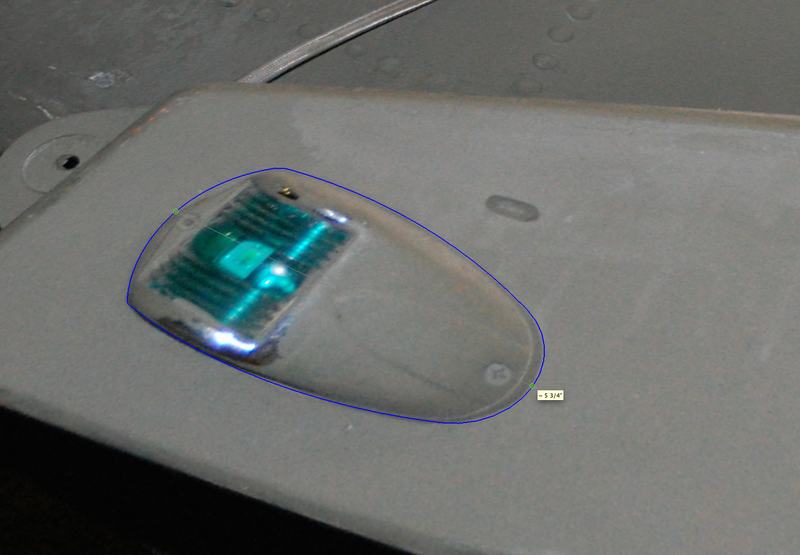 Take a look at the previous post for the full story on it and another scanner called the Sensor. The more I investigate the Spike the more excited I get about getting my hands on one of them next April. The developers are writing code for more applications even as we speak and are working on a beta app to enable the device to create a point cloud of a non rectangular shape like a gravel pile. This device is going to completely change my work methods of location surveying and make some jobs possible that would have been unthinkable before. It’s also designed to work with Sketchup and will export kmz files that import right into the program. They have extended the range of the device to 950 feet and have released a number of videos to explain the range of possibilities. 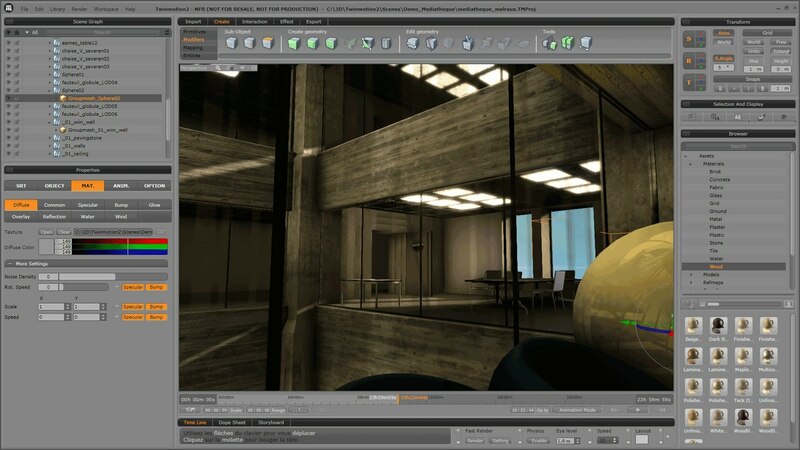 The video below shows using the company’s Ike3D device to measure an interior. I’m guessing, and hoping that the Spike will be able to capture interiors in a similar fashion. You might want to act fast if this looks interesting, as of this posting there are only 40 of the devices left at this pledge level. 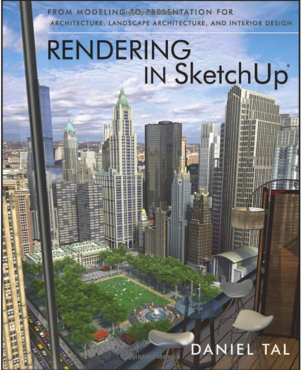 For those of you who work in Sketchup and are new to rendering, or are confused by all the different rendering software packages available, a new book is coming out March 25 that will help. Daniel Tal, landscape architect and author of Sketchup For Site Design, has written a new book, Rendering In Sketchup, which is now available for pre-order or as a digital download. 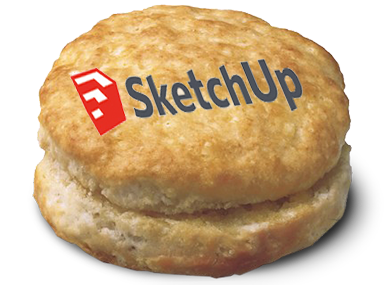 There are now a number of rendering programs on the market for use with Sketchup, with a majority of them working from within Sketchup without having to exit the program. This can be a plus or a minus depending on how you work. Even though most of the programs offer free-use trial periods of their software, It can be pretty difficult and time-consuming to decide which is the best one for your workflow and budget. 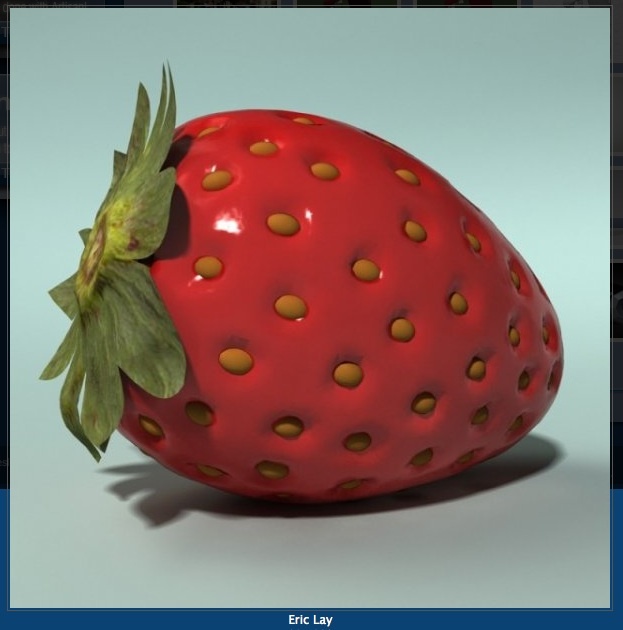 Daniel is an excellent teacher and has written a very thorough and detailed book on the process of rendering from Sketchup using a variety of software programs as well as explaining post-rendering work with Photoshop. 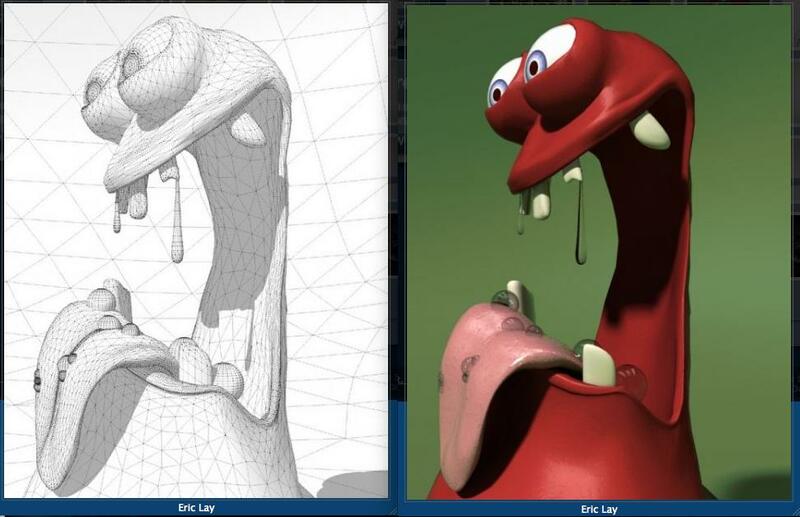 While not every rendering engine is covered, he does go into a great amount of detail explaining not only the basics of rendering, but his own methods using Shaderlight, SU Podium and Twilight Render. The book covers workflow, hardware requirements, how to model efficiently for renders, use and teaching of textures and a lot more. At over 600 pages, the book is both a reference and a guide and can be read for pertinent chapters rather than just cover to cover. 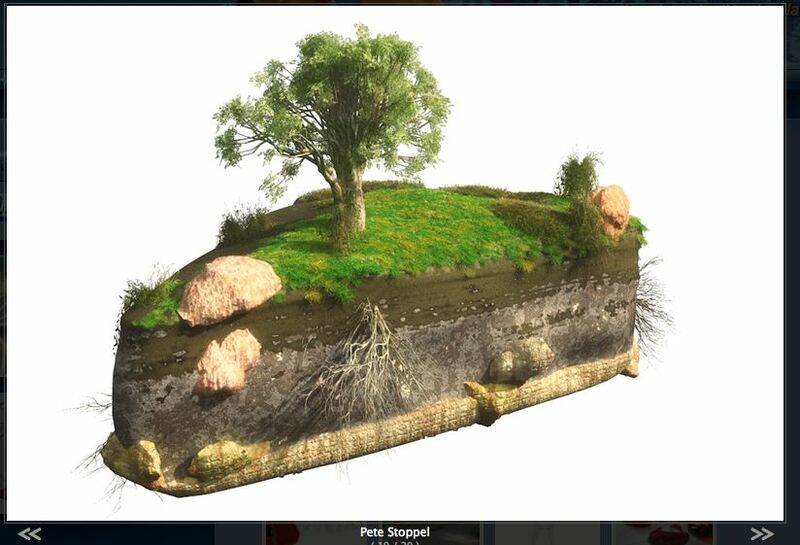 Land8 Webinar: Rendering in SketchUp – Daniel Tal from Land8.com on Vimeo. On Monday morning I, along with about 280 others, packed into the Boulder Theater in downtown Boulder, Colorado in the hope of finding answers. 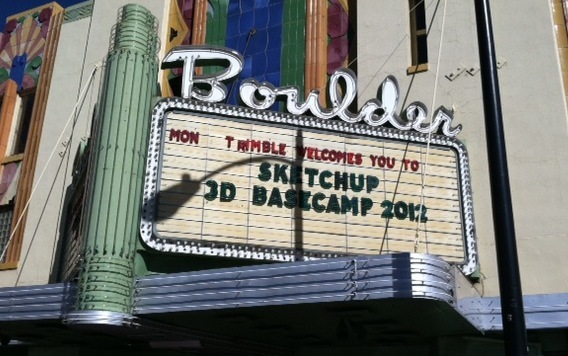 It was the first day of Sketchup Basecamp, a semi-annual event that attracts Sketchup users from around the world for a three-day conference that’s more like a cross between a family reunion and a college party than a traditional industry conference. When it was announced on April 26 of this year that Google was planning to sell Sketchup, a lot of people ( myself included ) got more than a little nervous. 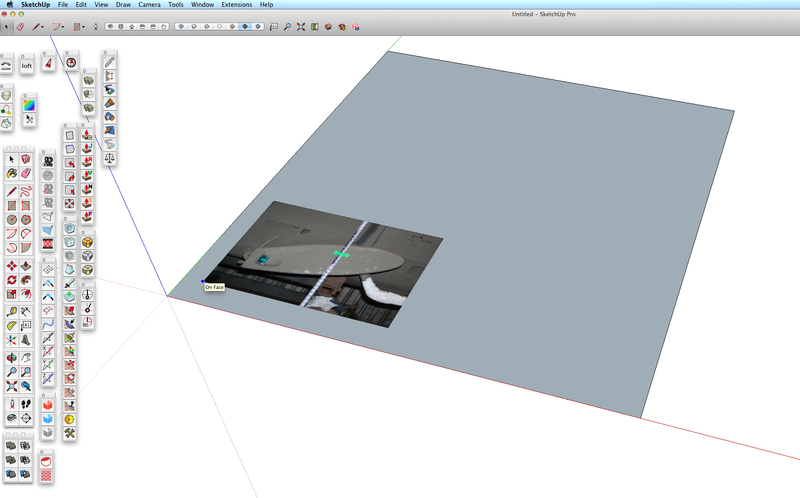 Sketchup is the sole piece of software I use for modeling sets and creating working drawings. Since purchasing the program in 2006, Sketchup has become the most-used modeler in the world with it’s user base growing to over 30 million people. The program was obviously very successful, so why was Google selling it off when it normally doesn’t divest itself of products. The last time they had sold a product investment was in 2009. A Sketchup blog article by Product Manager John Baucus on the same day helped to allay fears but there were still a lot of unanswered questions and concerns. Google had purchased Sketchup’s parent company, @Last Software in 2006 to provide content for Google Earth. The idea was to provide a free 3D modeling package that would allow people to create buildings for use in Google Earth. Even with a paid version of Google Earth it seems that Earth was never a profit generator for them and with the introduction of a new system which allows Google to now create models from auto-generated 3D mesh buildings from photo-grammatical data gathered from satellites and unmanned aircraft, it seems that they no longer saw a need for a 3D modeling program. There was speculation in the engineering industry that the company would be sold to Dassault Systemes, but when the announcement was made it was revealed that Sketchup would be purchased by Trimble Navigation. Far from dumping the software in a fire-sale, Google wanted to make sure Sketchup went to a good home. Google had a previous relationship with Trimble having used their GPS systems in developing Google Earth. Trimble Vice President Bryn Fosburgh was there in Boulder at the opening session to explain how they saw Sketchup’s position in the company’s structure. Having established itself in the engineering and construction side of the industry, the acquisition of Sketchup is seen as a way of extending the firm’s footprint into the design phase of the industries as well. He said they saw the modeling company as becoming seamlessly integrated with the other companies’ software and hardware products and said his only surprise after the purchase was getting used to the unusual dog-rich environment of the Sketchup offices. Users of their products like the Robotic Total Station will be able to bring the file from a Sketchup model of a house into the device and have it’s laser lay out the corners of the building with 1 centimeter accuracy. A problem most companies have is learning when to leave acquisitions alone. Much like biscuits, where over-handling the mix leads to leaden, inedible lumps. Trimble seems to have a record for buying quality companies, integrating them into the family, and then leaving the work to the people that know best how to implement it. Joined on stage by Sketchup Product Manager John Baucus, Product Evangelist Aidan Chopra and a number of others from the company, the group quickly explained the plans Trimble has set for the 3D modeler: the program is going to stay simple to use, and it’s going to get a lot more complex as well. The company sees Sketchup as a platform as well as an application. – There will always be a free version of Sketchup available and the basic program will never be more complicated to learn. -The Pro version will continue to be developed and you will see a continually greater difference between it’s abilities and those of the free version. -They will continue to support 3rd party developers in creating compatible software and plugins to work within Sketchup. Over 45% of users have and use 3rd party plugins with Sketchup and they want to continue to support the creation of useful additions that they would never develop in-house, hoping that each industry will take the initiative in creating plugins for specific needs. -They will continue to support “everyone else” as well. Since the program is used in so many varied industries and vocations, the company wants the software to be truly useful to anyone who uses it to create. -They plan to continue to make the software run bigger and more complex models as fast as possible by any means they can. -The company is ramping up their team size and is currently looking for new talent. Trimble is pumping a lot of money into the company, especially in Layout, their software for creating construction drawings from Sketchup models. They plan on continuing to improve the drawing program to equal any CAD package out there. -Starting in 2013 with the release of the next version, the company will now go to annual updates instead of the random release dates we’ve become used to. Another sign that the software’s development is going to proceed at a much faster rate than it did at Google. Also, there are plans to overhaul the 3D Warehouse. The Warehouse now contains over 2 million models with over 1000 new models added each week, many by major manufacturers. They plan to update it to make it easier to use and easier to find content. 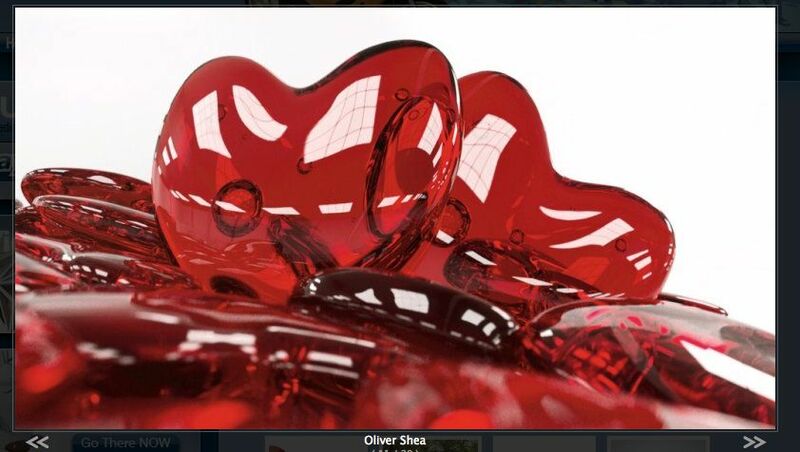 And, it was announced that the company has developed an STL importer/exporter for creating model files for use in stereolithography and 3D printing. Now that companies like Makerbot have made desk-top 3D printers available in the $2000 range, 3D printing may soon become as common as paper printers. They have licensed STL plugin code from three outside developers, streamlined it and offer it as a free plugin. You can download it here. All in all, the switch to Trimble ownership looks like a much better fit than it did with Google. Although as John Baucus will say, plenty of good things came from the Google purchase. 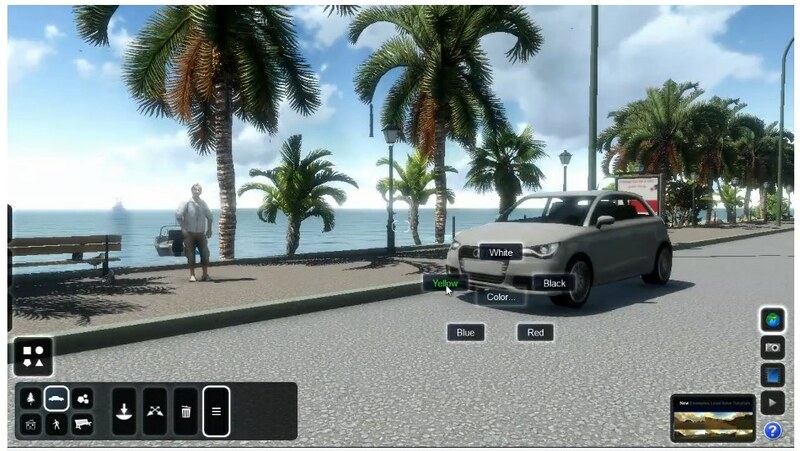 It was at Google that the free version of the software was launched and the 3D Warehouse came into being. And, kudos to Google for making sure the company went to a good new home and wasn’t just cut loose.